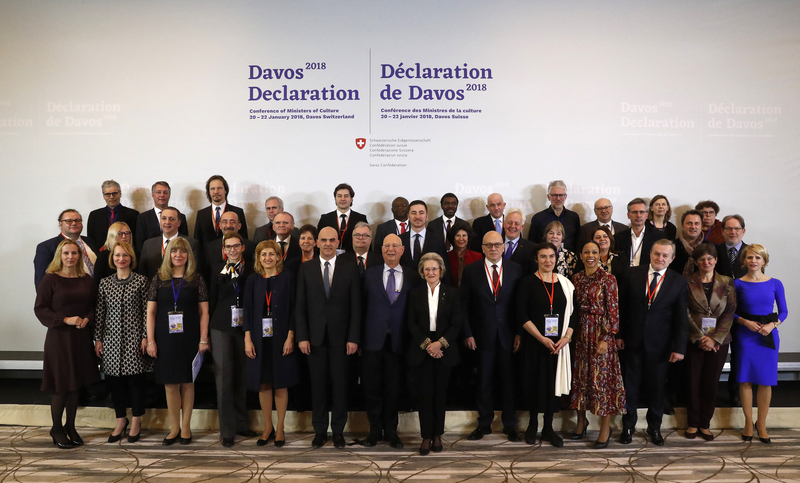 Bern, 22.01.2018 - On 21 and 22 January 2018 the European Ministers of Culture were invited by the President of the Swiss Confederation, Alain Berset, to attend a meeting in Davos. In advance of the Annual Meeting of the WEF they adopted a declaration which highlights pathways for politically and strategically promoting the concept of a high-quality Baukultur in Europe. The Davos Declaration emphasises the central role of culture in the quality of our living environment. It reminds us that building is culture and creates space for culture. Taking a holistic approach, the joint responsibility of politics and society for the built environment is stressed and a European policy of achieving high-quality Baukultur is called for. The built environment has a significant impact on the wellbeing and quality of life of all residents of an area. It is of crucial importance for social interaction and cohesion, and for creativity and people’s identification with the locality. Ensuring the high-quality development of existing settlement areas and the careful treatment of the landscape are among the central challenges faced by society today and the Baukultur of the future. The quality of our cities, towns, villages and landscapes is under pressure; urban sprawl, faceless agglomerations and rampantly growing traffic areas have a negative impact on society. The goal is to develop European policies that aim to achieve a long-term improvement in the way the built environment is designed in future. The theme of the conference will be revisited at the Annual Meeting of the WEF. By organising the conference to mark the European Year of Cultural Heritage, Switzerland emphasises the importance of Baukultur. This includes both architectural heritage and contemporary design and construction. At a national level, a similar endeavour, adhering to the principles voiced in the Declaration, is already underway. As part of the 2016-2020 Culture Dispatch, the Federal Government has decided to develop a Baukultur Strategy, which will be completed by 2020.